Saslik, the most legendary restaurant in Finland, has honourably cherished the food tradition and the atmosphere of the Czarist era since 1972. In 40 years Saslik has grown from a restaurant to a landmark. Among both Finns and foreign guests, the restaurant is one of the best-known restaurants in Finland and a sight in itself. 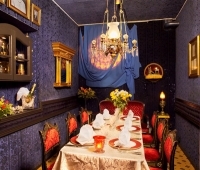 Uniquely decorated milieu together with Czarist hospitality and food culture offer unforgettable experiences for all senses. 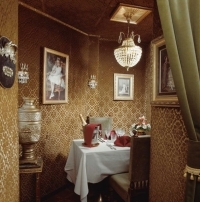 Saslik's à la carte menu includes the classics of the Russian cuisine such as Borsch soup, Caviar, Blini, Pickled Russian cucumber, Zakuska appetizers and Pelmeni. Also Saslik's most favourite dishes like Ivan's Sword, Spiced fillet of beef and Baked Alaska have remained on the menu for nearly 40 years. All main courses are served on a hot griddle. Saslik is also world famous for its exotic bear dishes, which are served the year round. Russian specialities can also be found on restaurant's drink list. Eight unique private rooms offer unforgettable surroundings for parties of 4-50 persons - for meetings, business lunches, festive dinners and family celebrations. Lunch and dinner guests are charged no extra for the use of a private room and meeting equipments. In the main dining room there is also a romantic Diamond Suite for two persons. Russian troubadours perform Wed-Sat evenings both in dining rooms as well as in private rooms starting at 20.00 hrs. Join us for a culinary trip to czarist Russia!